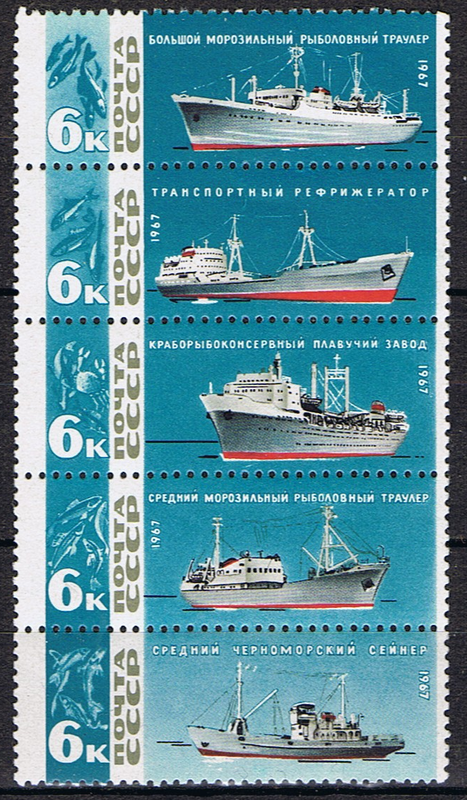 Issued on February 28, 1967 was a set of 5 stamps depicting various ships from the Soviet fishing fleet along with various type of sea life. All are demoninated 6 ruble and are perforated 12 x 11½. They stamps were printed by lithography. This is one of my favourite sets of stamps. I like the image of the various fishing vessels with a depiction of the fish that they fish for. The top stamp depicts a trawler/factory ship. On these ships the catch is processed on board. The second stamp depicts a refrigeration ship. Where the catch would be stored but processed to the extent that a factory ship is capable. The thrird stamp in the set shows us a crab canning ship. This type of ship is similar to the factory ship but is specific to processing and canning a crab catch. The fourth ship is a trawler. On these ships the catch is preserved but processed at either a factory on shore or transfered to a factory ship. 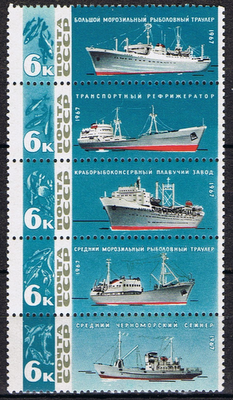 The last stamp in the set depicts a Black Sea seiner. A seiner is a ship that uses a seine (a net with weights on one end floats an the other). As of 2002 the Russian fishing fleet was composed of 2,500 fishing vessels, 366 transport and 46 factory ships with a length overall greater than 24 metres (78' 9"). As of 2005 there were an additional 2,491 fishing vessels smaller than this. The fleet is quite old and not equipped to modern standards in terms of fishing and safety.